I didn't get a chance to make a fresh lunch box today, but I made this bento earlier in the year and hadn't had a chance to post it. As you can see by the little hand in the corner, someone was anxious to eat. This bento contains Apple, Chickpeas, Sweet Potato Snowflakes, Hamburger and Okra. I remember the little man eating this lunch, but refusing the sweet potato shapes! Probably unlike the average kid, Ethan prefers his potatoes with the skin on. These skinless potatoes, despite being cute, were deemed unacceptable for toddler consumption. Today's lunch was a huge hit! Ethan loves "hamburger" so he was thrilled w/ the ground beef. Sweet Potato is also a favorite along w/ Apple and Blueberries, plus he was excited to see a good amount of Coconut Yogurt in his lunch box. I've long since learned, that my child refuses yogurt of any variety other than plain and white, but he did a little bit of fruit dipping of his own. Snack is Grapes and Rice Chex which I have sprinkled with cinnamon (store bought Cinnamon Chex have a peanut warning so it's off limits). Also posted to What's For Lunch Wednesday. We had a wonderfully sunny day on Monday! 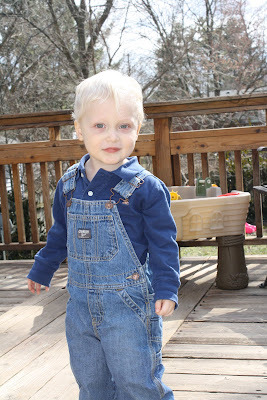 Once again, it doesn't make for the best lunch photo, but we had a lot of fun outside enjoying the nice weather. My lunchbox is pictured w/ leftover roasted chicken, raw carrots and green beans w/ ranch dip, pretzel sticks and grapes. I didn't get a photo of Ethan's lunch before he was digging in, but the in-action shot shows leftover roasted chicken; raw peppers, carrots and green beans w/ coconut yogurt dip; leftover roasted potatoes and carrots; plus grapes. He made it very clear that he wants the same lunch box as mommy ... the laptop lunchbox! My husband and I decided to go out to lunch today. Since Ethan can't eat restaurant food due to his food allergies (and cross-contamination/mistake risk), he got a lunch box to bring along. He actually loves eating out even though it's still the same ole food for him. I think he just enjoys the change of scenery and people watching. As you can see from the photo, the sun was out in full force today! It makes getting a good photo a lot harder, but I'm not complaining! I always overpack Ethan's to-go lunches just to make sure he has enough foods he likes to be satisfied while we eat. His lunch today was Avocado on Tapioca Bread, Red and Yellow Sweet Peppers w/ Coconut Yogurt Dip, Applegate Farms Turkey (his safe lunchmeat brand), EnerG Pretzels and Pear w/ Grapes. He ended up eating all the peppers first, then the turkey and grapes w/ just a few bites of sandwich and pretzels. We had a few errands to run afterwards. By the time we got home, Ethan was hungry and ready to finish his fruit and sandwich. The uneaten pretzels got dumped into his snack cup in his backpack for the next time we're out, so nothing gets wasted. It was such a dreary day on Friday, but you'd never know it by this photo. We took advantage our our 2 minutes of sunshine just before lunch. Overall we had a very lazy day, so I just made an easy sunbutter on tapioca bread sandwich for Ethan, or "wee-chah" as he calls it in his toddler Spanglish. Funny enough, the child is a little weirded out when I cut his food into shapes. I had to convince him these were actually edible. To balance out the sandwich, I also packed leftover steamed carrots and green beans plus pear and blueberries. The little man was a very willing participant in Day 2 of our lunchbox project. He even helped me put the vegetables in the pot, eating several in the process. Last night, I had some defrosted some chicken breasts sitting in the fridge so I decided to make chicken sausage. It's pretty tasty if I do say so myself. The guys of the household concur. For lunch, we had homemade chicken sausage (of course), the carrots and green beans Ethan helped me make, apple, grapes, and wild rice. Ethan's lunchbox also contains an Enjoy Life Sunbutter bar and pear for his after nap snack. I was very surprised today when Ethan ate all his fruits and veggies first, ate no rice and only one half of a sausage. He usually downs the meat first thing. Since I worked tonight, Ethan had his leftovers for dinner where he was apparently back in the mood for rice and sausage. Even though, I am not religious, I was raised in a Catholic family and always loved the challenge set forth during lent. I was recently reading one of my favorite blogs Clover Lane and saw her 40 Bags, 40 Days challenge in which she cleans out her entire house, aiming to get rid of 40 bags of stuff during lent. While I am trying that challenge myself, with only one child and a small house, I'm not sure I can wrangle up a full 40 bags of unnecessary stuff to purge. I was, however, inspired to try another 40 day challenge of my own ... 40 days of lunch boxes. Seeing as I'm working on improving my diet and I'm always looking for an excuse to use my bento boxes, I figured it was the perfect project for me this year. Today is Day 1! I didn't cook last night, but had some homemade chicken soup in the freezer just waiting to be eaten. I cooked some fresh rice noodles and threw them into the soup (they seem to get mushy if I freeze them in the soup). To get our veggies, we both had okra plus I had a green salad w/ purple cabbage. Ethan is not a salad fan yet (and I'm not a raw pepper fan), so he had raw red and yellow bell pepper sticks plus coconut yogurt for dipping. We both had apple and blueberries, though his has a much higher berry to apple ratio to satisfy his current blueberry addiction. I thought this would be way too much food for a 2.5 year old, so I filled the last portion of Ethan's lunchbox w/ grapes and EnerG pretzels that were set aside for a snack later. 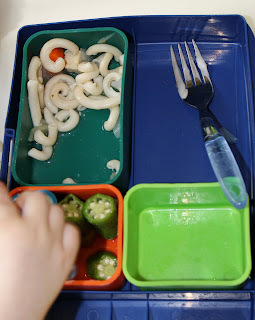 In the past, I had always removed the inner containers from the box at mealtime to make it easier for him to reach the food. Today, he insisted they stay in the box! Ethan was DELIGHTED with his lunch. First went the soup, then the peppers. After discovering the fruit was also glorious dipped in the yogurt, it was quickly inhaled. He even dunked a few pieces of okra in the stuff. That part grossed me out, but if he's eating his veggies I'm not complaining! The child was so hungry, I refilled his soup twice. About 1/3 of the noodles lost their way off the spoon and ended up all over the chair, but that's still a lot of food. Someone much be about to hit a growth spurt! I'm so grateful for our time together this morning. We had such a great Mommy-Son lunch today! Also posted at Whats For Lunch Wednesday.